What are the 20 fastest growing career? For many years it was thought that brain development was set at a fairly early age. By the time teen years were reached the brain was thought to be largely finished. However, scientists doing cutting-edge research using magnetic resonance imaging, or MRI, have mapped the brain from early childhood into to adulthood and found very contrary data. It now appears the brain continues to change into the early 20's with the frontal lobes, responsible for reasoning and problem solving, developing last. Can you develop a questionnaire form to provide psychological data to support these studies? Constructed from MRI scans of healthy children and teens, the time-lapse "movie", from which the above images were extracted, compresses 15 years of brain development (ages 5–20) into just a few seconds. Red indicates more gray matter, blue less gray matter. Gray matter wanes in a back-to-front wave as the brain matures and neural connections are pruned. Although scientists don't know yet what accounts for the observed changes, they may parallel a pruning process that occurs early in life that appears to follow the principle of "use-it-or-lose-it:" neural connections, or synapses, that get exercised are retained, while those that don't are lost. Create a questionnaire form to access Risk Taking..
Use the questionnaire on 4 age groups (range from 5-20). You should have at least 10-15 subjects in each group to provide enough data. 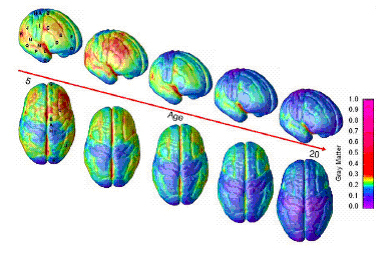 Compare your data with changes in brain development using the data from TIME LAPSE PHOTOGRAPHY.